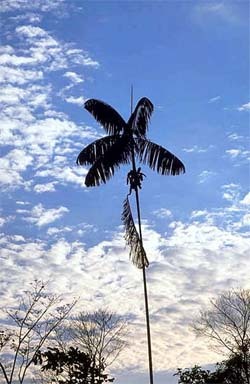 A solitary, tall, moderately slow growing, monoecious, crownshaft palm. Common in cultivation, locally common in the wild. It has a smooth, light-grey trunk, 15 m. (49 ft.) tall, 20 cm. (8 inch) diameter with no obvious leaf scars, and huge segmented, pinnate (feather) leaves, 3 m. (10 ft.) long, 0.6 m. (2 ft.) wide, dark green above and beneath. Wettinia quinaria can survive freezing temperatures to about -3.8°C (25°F), but freezing is best avoided. It naturally occurs in wet rainforest or seasonally wet forest in montane locations. In this type of natural environment temperature fluctuations are slight, and this palm prefers a constantly cool or mild climate with little temperature difference between day & night, and Summer & Winter. Under extreme freezing conditions we recommend you keep this palm as dry as possible, and well wrapped up. Stem solitary, 8-15 m tall and 10-20 cm in diameter, smooth. Leaves 3-5.5 m long; pinnae 35-60 on each side, entire, pendulous, sparsely pubescent below, the central ones 60-115 cm long and 4-12 cm wide, with 16-18 prominent veins. Inflorescences 5-7 per node; peduncle 10-40 cm long; rachis 1-8 cm long; branches 4-7, to 40 cm long. Male flowers ca. 8 mm long, with 8-11 stamens. Female flowers densely crowded along the branches, to 20 mm long. Fruits green, with sparse white pubescence, ca. 2-3.5 cm long and 1.5-2.5 cm in diameter, forming 4-7 sausage-like clusters. 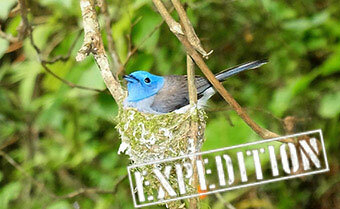 W Colombia and Ecuador, in wet forest up to 1000 m elevation. Often dominant in areas with more than 4000 mm precipitation. Very abundant in lowland to premontane rain forest, from sea-level to 1000 m elevation. One of the most common palm trees of the Pacific coast.